Asbestosis is a progressive and irreversible lung condition that typically leads to subsequent respiratory disability. Please click on the following links to find out more about the asbestos lung condition Asbestosis. 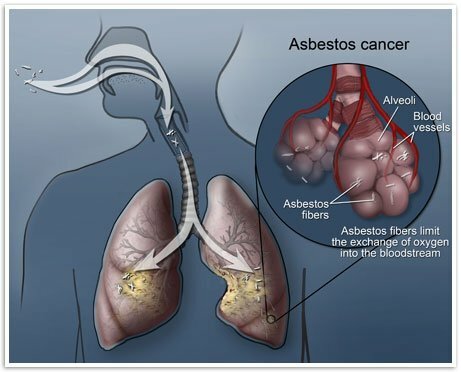 Asbestosis is a lung condition, often referred to as a “diffuse pulmonary fibrosis” which results from the inhalation of asbestos fibers. It is one of a number of diseases categorized as occupational lung disease or environmental lung disease. A unique aspect of asbestosis that distinguishes it from other fibrotic diseases (such as silicosis) is the presence of asbestos bodies and fibers in the lung tissue. Additionally, asbestos bodies and fibers have been detected in small numbers beyond the lung: in tonsils, thoracic and abdominal lymph nodes, pleura, peritoneum, liver, spleen, pancreas, kidneys, small and large intestines, esophagus and stomach. How Did I Get Asbestosis? Asbestos exposure results from people inhaling fibers that are in the air when they breathe. The people with the heaviest risk of exposure to asbestos are those who work directly with the mineral, whether is mining or processing it, during production of asbestos-containing products, or during installation of asbestos insulation. Family members of asbestos workers are also at risk of inhaling high doses of asbestos fibers. Every member of the household can become exposed to asbestos by coming in contact with and inhaling asbestos fibers that are unknowingly carried home from work on their family member’s clothing. Exposure to building materials that contain asbestos, specifically in older building is also a concern. If over a period of time insulation material, floor or ceiling tiles start to decompose, asbestos fibers can become airborne and may pose a serious health threat. In this type of situation, asbestos fibers tend to create a dust composed of tiny particles that can float in the air. However, as long as the material is not damaged or disturbed, such as remodeling or drilling, then the asbestos fibers will not be release into the air and therefore will not pose a threat to human health. Asbestos contamination can also result from ingesting contaminated food or liquids. It can also be detected in the water supply as well as in the air. Asbestos may be released into the water through erosion or natural deposits, corrosion from asbestos-cement pipes, and disintegration of roofing materials containing asbestos that are then transported into the sewers. What Are The Clinical Signs Of Asbestosis? Other more advanced symptoms of this disease include clubbing of the fingers (increased thickness of the digits and curvature of the nails) and cor pulmonale. Medical monitoring for radiologic changes is key, as persons with asbestosis have an increased risk of developing a malignancy.